The energy used in commercial buildings accounts for nearly 17 percent of the United States’ emissions of greenhouse gases (GHGs) linked to global climate change, making buildings an important part of your GHG inventory. In order to help you assess the emissions footprint associated with your energy consumption, Portfolio Manager incorporates a number of metrics to quantify these emissions. Greenhouse gases are gases in the atmosphere that are responsible for causing global warming and climate change. Gas-the main greenhouse gas is carbon dioxide (CO2), methane (CH4) and nitrous oxide (N2O). The greenhouse gases that are less common, but very powerful, hydrofluorocarbons (HFCs) are, perfluorocarbons (PFCts) and sulphur hexafluoride (SF6) (anonymous, 2010). The rest of the solar radiation entering the Earth will turn into long-wave radiation in the form of infrared. The entire radiation emitted by objects of the Earth is infrared radiation. Greenhouse gases can be entered by solar radiation but does not allow infrared radiation to come out. As a result, the Earth's temperature will have increased because of the accumulated energy of radiation on Earth. The Earth absorbs most solar energy and reflect back the rest. GHGs on Earth's troposphere is capable of transmitting most of the solar radiation but also able to withstand the infrared radiation is contained in the reflection. But when GHGs envelop the Earth with excessive levels, the reflection of infrared radiation will be trapped in the atmosphere so that the Earth's temperature is rising hotter than normal temperatures in long periods (Cengel, 1997). Global climate change is happening lately due to disruption of the energy balance between the Earth and the atmosphere. 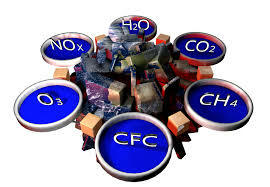 The balance is affected among other things by the increase of the acid gases charcoal or carbon dioxide (CO2), methane (CH4) and nitrous oxide (N2O) better known as greenhouse gases (GHGs). The current concentration of GHGs has reached a level that endangers the Earth's climate and ecosystem balance. An increase in concentration in the atmosphere as the GHGs due to inappropriate land management, among others, the existence of a burning forest vegetation in wide scale at the same time and the presence of drying peat. These activities are generally performed on a scratch over land use forest into agricultural land (Hairiah and Rahayu 2007). Greenhouse emissions as the cause of the onset of global warming. Industrialization and development provide important creation of global warming. There have been many attempts to suppress or prevent an increase in global warming, not only in the local context, but also in the international and national level (Rudy 2008). The accumulation of greenhouse gases due to changes in land cover and forestry estimated at 20% of the total global emissions that contribute to global warming and climate change. This confirms that climate change mitigation efforts need to involve sectors of land cover change and forestry. Given the very important role forests not only as a repository for carbon, but naturally also serves as the most efficient carbon sinks on Earth at the same time a source of greenhouse gas emissions at a time when not managed properly (Manuri, Chandra and Agus, 2011). The trees became the dominant organisms in tropical forests, tree of life forms effect on the General physiognomy, the production base, and the whole circle of community. Many traits of tropical trees in contrast with other areas considering there are certain traits and habits of branching, leaves, fruits and root system rarely and never found in other parts of the Earth (Longman and Jenik, 1987). 1. Forest fires and Reducing greenhouse gas emissions. 2. Maintain the closure of the forest and its potential to prevent climate change. 3. Setting of the forest management activities to capture or absorb additional CO in the atmosphere. 4. Carbon capture and storage in the carbon pool of forest and wood usage in the long run. 5. Develop a carbon trading market and create incentives for forestry activities that reduce industrial emissions and other pollutants producing.